Have you played with turtle graphics? I enjoyed Logo ages and ages ago. 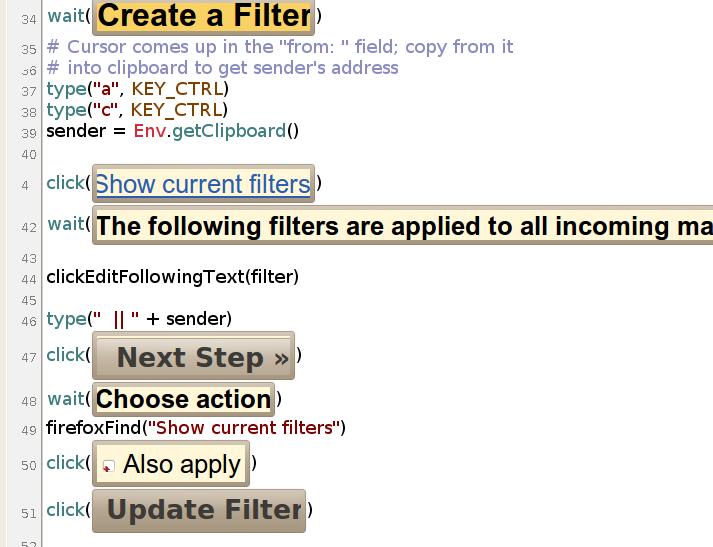 Nowadays there's a turtle module in Python's standard library, plus several other implementations. But all the implementations I know of keep the poor little turtle stuck inside a dull little window. Last night I realized that, with Sikuli, I can set the turtle free! It can roam freely beyond one little window and have adventures in the big, wide world. 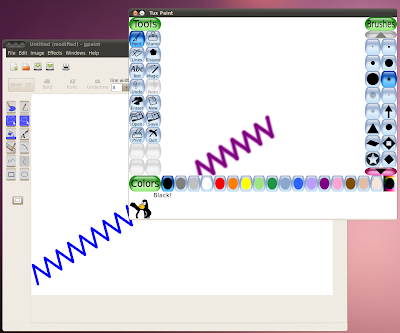 Here it is marching right past the edge of TuxPaint and onto GNU Paint. Note that this is an invisible turtle. But you can see its effects. For the new free-range turtle, "penDown" and "penUp" are actually "mouse button down" and "mouse button up". If it's walking across a drawing program with a paintbrush turned on, it will paint a line like a traditional Logo turtle. Otherwise, it will click and drag its way across your desktop and your other applications. This turtle can be mischievous! What really pleased me was just how easy it was to implement with Sikuli. Here's the code in an .skl bundle - it's a zipfile that Sikuli can use directly. fraction = extent / 360. Gmail filters are great, but I've got some filters that apply to a hundred different senders - and I'm always adding new senders to them. I've wished for an automated way to add the sender of the message I'm currently viewing to one of my filters. I'm sure this could be done in Greasemonkey, Selenium, etc., but Sikuli is my tool of interest for the moment - and, after some fumbling, I'm really happy with it. View the Sikuli code, or download it and run it with /path/to/your/sikuli-ide.sh spammy.skl - except you'll probably want to edit the keywords identifying your filter, and possibly recreate the graphics to match your own Firefox theme. Mostly, it's there as an example to learn from. I'm learning plenty that will go into my Ohio LinuxFest talk, but the big lesson for today is to rely on keyboard-based and text-based techniques rather than picture-finding whenever they're available. For instance, how should I click a button that might have scrolled off the bottom of the screen? There are lots of ways - I could embed find() in a loop with type(Key.PAGE_DOWN), for example - but it's more reliable to piggyback off Firefox's "Find" to zoom in on the text on (or near) the button and then find it. Your computer should save you from doing tedious and repetitive tasks yourself, but automation programming has been too difficult for casual uses. MIT's Project Sikuli changes that. It fuses traditional text-base scripts with actual screenshots of targets on your screen, making programming simple, versatile, and useful. If you've ever told a friend, "Go here, now click on this, then on that", you know enough to start using Sikuli. 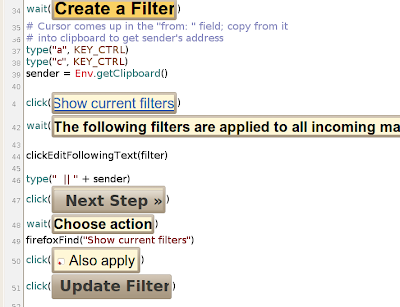 Let Project Sikuli shake up your notions of what programming is like. Ohio Linux Fest, Sep. 10 - 12. Oh, yes, I feel I should record this little incident from PyOhio 2010, for the sake of evidence during Nick's trial. I used PyOhio's Lightning Talks to give away our swag prizes; and, in the spirit of open-source, I put the code on the projector for everyone to see. Then I realized that I didn't have the Lightning Talk sign-up board, so I went out into the hall to get it. I was gone maybe 60 seconds. When I got back, I called pick() and got... Nick Bastin! The room giggled. Nick said, "Wow, that's the first time I've written bug-free code on the first try!" I didn't get it, so he said, "Why don't you pick another winner?" The nice thing is, my code was intact. However, this was lurking in my directory. The lesson here is: Many eyeballs can help protect you from malicious code... unless they're all in on it!